Kom dichter bij de iconische Royal Guards tijdens deze interactieve 1,5 uur durende wandeling door Londen. Kom meer te weten over het koninklijke erfgoed van Londen terwijl je bezienswaardigheden als Pall Mall, de hertog van York Column, de Royal Society en het Marlborough House passeert en geniet vervolgens van een prachtig uitzicht op de beroemde ceremonie Changing of the Guards in Buckingham Palace. 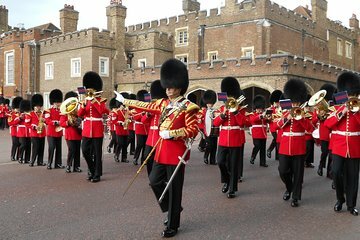 Je ziet niet alleen de militaire bands en marcherende bewakers, maar je kunt ook langs de Oude Garde marcheren terwijl ze van de St. James Palace naar de Wellington-Kazerne trekken. Gavin with Fun Tours was our guide - and he was completely AWESOME!! It was very easy to meet him at the Picadilly Circus subway stop. He gave us history all along the way as we walked toward James Palace. He told us ahead of time what the plan was so that we would know what to expect. We saw the guard as they came out of the palace - we were standing right in the front row. He quickly took us to other points along the changing of the guards route so that we could again have a front row. He explained all that the guards were doing. At the end, he took individual photos of those who wished with Buckingham Palace in the background. I can't recommend Gavin enough!! Excellent experience with our guide Angus, who took us to the best viewing places and was interesting and fun to listen to. Highly recommend! Our Guide was wonderful, He was very informative and really knew all the history of the Royal family and the changing of the Guard. I highly recommend this tour when you visit London!! Great tour! We were going to skip the tour and just go to the palace to see the changing of the guard but read online that the tour was worth it, so we booked. Best decision for this event. Tom, our tour guide was fantastic, he knew the history, he knew the route and he made it fun for everyone. The tour covers a number of different sights before getting to the location that the guards march from. You see them getting ready and then you march with them all the way down to the palace. So much better than standing with the crowds at the gate and waiting for the guards to come. Worthwhile and a lot of fun. A fun way to see the changing of the guards! A really good tour. Angus was the host of this tour and used his Shakespearean skills well. An entertaining morning. Our guide was amazing! Friends told us we could see the Changing of the Guard for free. I thought this tour was worth every penny!! Fast paced through a very dense crowd. Easy to lose the guide so stay aware! Something to do if you've seen the changing of the guard before.